Reports of the inclusion of Google Chrome with the latest avast! upgrade began trickling in several days ago when Version 7 was released. As illustrated below, the issue is complicated by differing reports of the upgrade process. Some avast! users report that they were not presented with the pre-checked option to install Google Chrome. People with Google Chrome installed have reported that even unchecking the installation option resulted in a second install of Chrome! In addition, that second install wrecked havoc with the existing Chrome installation, resetting the current users profile to default and extensions missing. Others reported problems with Hostman Server and Sandboxie, necessitating an uninstall/reinstall of avast!. Granted, the Google Chrome browser is not scareware, adware or spyware. When a vendor includes an add-on such as a toolbar or, in this case, the Google Browser, the point is "pay per install", thus the reason for the pre-checked option. "I used to recommend Avast. I won't be doing that anymore. I just don't trust it after this happened and I see all the issues others had." "One more dissatisfied user here! 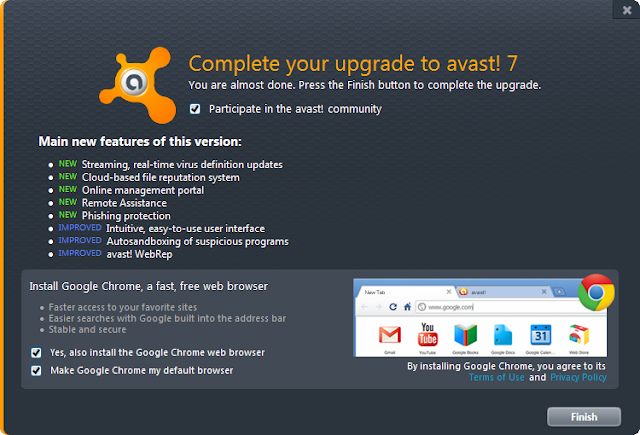 Avast notified me that it wanted to install Version 7. NOTHING ABOUT CHROME!! Then after it installed 7 a screen pops up asking if I wanted to install Chrome. I responded NO and the then the 7 installation wanted me to click "Finish." When the screen cleared there was a Chrome icon on the desktop." "The install welcome screen launched and before I had time to read the screen the install started never a chance to opt-out or configure the install." "I didn't have Chrome on my pc before I updated avas6. On rebooting the pc I found to my absolute horror that the developers at avast thik they know better than me about what software I need and had installed chrome. At no time did ANY warning appear, or my consent was sought to install anything other than the update. I consider this action to be one of MALWARE." When upgrading to avast! Version 7, select "Custom" install and select the options you want to use. According to your preferences, leave checked or uncheck the option to "Participate in the avast! community". a) First, uncheck "Make Google Chrome my default browser". b) Next, uncheck "No, do not install the Google Chrome web browser". Adobe released updates to both Adobe Flash and Shockwave Players. The updates address critical vulnerabilities to both products. Vulnerability and update information details for both products is included below. As described in the Security Bulletin for Adobe Flash Player, the critical vulnerabilities addressed in the update could cause a crash and potentially allow an attacker to take control of the affected system. It is also noted that the update addresses a cross-site scripting vulnerability in Internet Explorer on Windows systems that is being exploited in the wild. The update to Adobe Shockwave Player for both Windows and Macintosh systems addresses vulnerabilities that could allow an attacker, who successfully exploits these vulnerabilities, to run malicious code on the affected system. The vulnerabilities include a heap overflow vulnerability and multiple memory corruption vulnerabilities. The newest version of Shockwave Player 11.6.4.634 is available here: http://get.adobe.com/shockwave/. Oracle Java released a critical security update to Java. This Critical Patch Update contains fourteen (14) new security fixes across Java SE products. For Java SE 6, the full internal version number for this update release is 1.6.0_31-b04 (b05 in Windows, where "b" means "build"). The external version number is 6u31. It appears that Java SE 7 is no longer in "developer preview". In the event you update to that version, check installed programs because it does not appear that upgrading removes Java SE 6. The full internal version number for the update to the Java SE 7 release is 1.7.0_03-b04 (b05 in Windows, where "b" means "build"). The external version number is 7u3. The next scheduled Oracle Java SE Critical Patch Update is 12 June 2012. Microsoft released nine (9) bulletins, of which four bulletins are identified as Critical with the remaining five as Important. 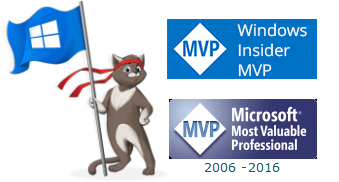 A number of people have a problem with .NET Framework updates. As MS12-016 updates .NET Framework, it is recommended that this update by installed separately, followed by a shutdown/restart. Mozilla quickly released Firefox 10.0.1, which includes a critical security update as well as a bug fix to a java-related issue which results in text input to become unresponsive (Bug 718939). The update to Firefox 10.0.1 will be offered through the browser update mechanism. However, as the upgrade includes a critical security update, it is recommended that the update be applied as soon as possible. To get the update now, select Help, About Firefox, Check for Updates. On Tuesday, February 14, 2012, Microsoft is planning to release nine (9) bulletins, of which four bulletins ares identified as Critical with the remaining five as Important. The bulletins address twenty-one (21) vulnerabilities in Microsoft Windows, Office, Internet Explorer, and .NET/Silverlight. Most updates will require a restart to complete the installation.